Rey Scott Kukan - Naval Air Station Fort Lauderdale Museum Naval Air Station Fort Lauderdale, the only military Museum in Broward County, on the register of historic places. Place of birth/date: January 9th, 1905, St. Louis Missouri. Branch of the Military: U.S. Army, attached to a Film Unit as a cameraman under Captain John Huston (famous director). Battles involved: In 1940 though not enlisted in the military at the time, he was present at the makeshift capital city of China, Chongqing (the most-bombed city in all of World War II), and filmed in full natural color the city being bombed by the Japanese-- with his hand-held 16mm camera. He filmed the sudden action from a vantage point in the rooftop of the U.S. Embassy, and this building was very close to the mayhem and firestorms caused by the bombing. Scott smuggled his film out of China by inserting the film into a bamboo pole over which he slung his baggage. This film would become known as “Kukan” (roughly translated to 'courage'), subtitled 'The Battle Cry of China.' The film became a landmark in documentary filmmaking. It was the first documentary to be recognized by the Oscars and marked a turning point in how documentaries were presented. 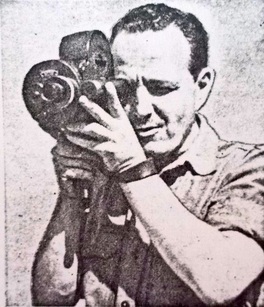 Before this film, documentaries were few in number, and were designed for propaganda and travelogue purposes, instead of presenting a truthful and objective view of a subject. When this film was presented to President Roosevelt, Roosevelt at first warned Scott that he was pressed for time and might not be able to finish the movie. However, during the viewing, Roosevelt canceled his appointments and became enraptured in the movie until the very end. Legacy: Scott was in Hawaii snapping photographs of tourists in the 1930's when he met a woman who had escaped from China-- at the time under attack by Japan. She implored him to document her country's plight, leading him to head for China. Scott was not awarded any medals from the military, but in 1941, he received an Honorary Academy Award (issued as a certificate instead of a statue, since there was no category for documentary films. The following year would see this category added to the Oscars.) Though crudely filmed and edited (Scott had no previous experience with movies), “Kukan” gave such an honest depiction of life in China (depicting China as a multi-ethnic, multi-lingual, and religious melting pot instead of a homogenous blob), that it is remembered as one of the greatest documentaries of all time, and one of the few non-censored, non-propaganda WWII films showing how brutal and destructive war can be for all human beings. Rey Scott was able to travel through war-torn China, traveling from Hong Kong to the wartime capital Chongqing, and then along the Burma Road to Lanzhou. From there, he ventured to Tibet, then back to Chongqing. Throughout the film, Scott narrated his journey and detailed various ethnic groups that make up the Chinese population, including the Miao people, from the mountains of Guizhou, the Muslim population of Lanzhou, the Buddhist population in Tibet, the nomads from the Gobi Desert and the Han and Manchu populations. After its debut, the film was sadly lost for 70 years, until a battered copy was found in Hawaii, and is currently being restored under the title “Finding Kukan”. After the War: Scott worked briefly for the Kansas City Star, married and had a family, and then in 1950 moved to Fort Lauderdale to set up Rey Scott Studios on Galt Ocean Mile. There, he would specialize in photographing Yachts, pictures for postcards, and portraits of prominent individuals. He had a regular feature called “Portrait of the Month” in the Gold Coast Magazine. Rey Scott passed away in 1992 in Marietta, Georgia. He was 87 years old. Rey Scott was a friend and neighbor of WWII veteran Allan McElhiney, founder of the NASFL Museum. led to the rediscovery of a lost historic film. By Allison Griner | 06 Mar 2016.